Epiphone Guitars are happy to pre-introduce to us 14 new models for 2010. 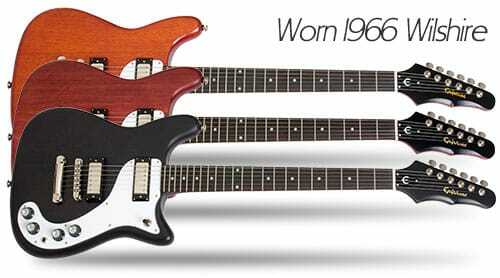 We expect to see these guitars at the 2010 Winter NAMM. For a teaser, we compiled brief information for each of the 14 new models–from Epiphone. Are you excited to see these guitars at NAMM 2010? We are! Commemorating the 50th Anniversary of the Holy Grail! 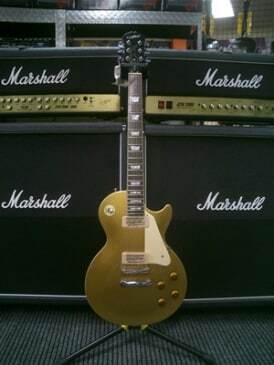 Most guitar historians and collectors consider the 1959 Les Paul Standard, the “holy grail” of Les Paul’s – not to mention of all electric guitars. Although the only significant change made in that year was to flatter, wider frets that allowed more dramatic bends, the impact of that change was not truly realized until the 1960’s when countless rock and blues players discovered the magical fat, warm voice and feel of the Les Paul Standard. As Good As It Gets! Epiphone’s history and association with Les Paul dates way back to the days when Les, working at the Epiphone factory on 14th St. in New York, created the world’s first electric guitar. Over the years, Les continued to work closely with Epiphone by reviewing new product ideas and offering suggestions. The NEW Epiphone “Tribute” Les Paul Standards honor that relationship by combining “as good as it gets” performance and features with legendary Epiphone quality and value. One of a Kind Sound from Epiphone’s Glorious Past! In 1957 Gibson purchased New York’s Epiphone Guitar Company and moved production to Kalamazoo, Michigan. With plans to expand retail distribution by differentiating Epiphone dealers from Gibson dealers, Gibson began production of a new line of “Kalamazoo-made and designed” Epiphones in 1959. For over a decade, Epiphone solid body guitars and basses were produced right alongside Gibsons. Classic Construction with SwingBucker Pickups! 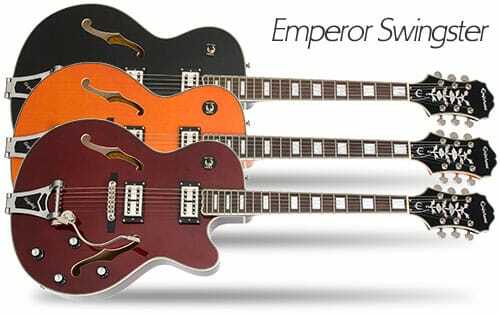 World famous for making some of the best and most innovative hollow-body guitars, Epiphone conjures up some of it’s past with the NEW Emperor Swingster. Starting with the same body and neck as used on their Emperor-II guitar and made famous by the jazz master himself, Joe Pass, Epiphone swings into action and turns it into a serious twangin’, rock-a-billy slingin’, country flingin’ machine! 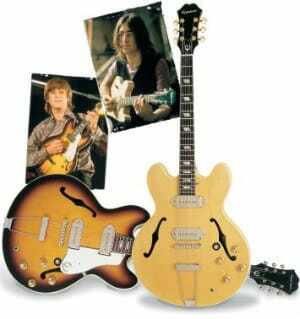 The Inspired by “1965” Lennon Casino: In 1966, during the recording of “Revolver,” John Lennon and George Harrison each acquired vintage sunburst Epiphone Casino guitars. The 1965 Casino is a reproduction of the original guitar John purchased with its sunburst finish and stock hardware. 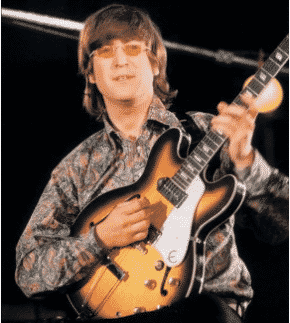 The NEW “Inspired by” John Lennon Casinos offer the professional musician the same key features of Epiphone’s acclaimed John Lennon signature U.S.A. Casinos but at a more affordable price. Also based upon the “1965” Casino and the “Revolution” Casino, these two “Inspired by” versions combine the cost-effective workmanship of Epiphone’s own factory in Asia with original Gibson U.S.A. electronics including classic P-90 pickups with dog-ear, nickel plated covers and a Switchcraft(tm) made toggle and output jack. The “Inspired by” Revolution Casino: In 1968, John had his Casino sanded down to the bare wood and covered with a thin, dull finish. 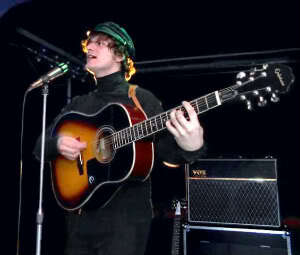 During that time, he also replaced the tuners with Gold Grovers and removed the pickguard. He first used this “natural” Casino during “The White Album” sessions in 1968. The “Inspired by” Revolution Casino is a reproduction of this stripped guitar and as it also remains today. Epiphone’s top-selling Special-II gets Revved UP! Since it’s introduction almost 20 years ago, The Special-II has met the needs of countless musicians with it’s combination of Les Paul features, great tone and affordability. Now, Epiphone puts a new twist on this classic with the NEW Special-II GT. Like the Special-II, this is a full-on, in your face rockin’ machine with all the same features (and more!) that you’ve come to expect from Epiphone. Presenting… A Zakk Wylde Original! There’s no question that Zakk Wylde is a one-of-a-kind performer and guitarist. As the lead guitarist for Ozzy Osbourne and founding leader of Black Label Society, Zakk has torched many a stage with his unique style and performance. Winner of multiple “Most Valuable Guitarist” awards in the metal genre, Zakk combines pure speed shredding with the use of pinch harmonics and chickin’ pickin’ to create a wall of sound that’s second to none. And like Zakk, his new limited edition Epiphone “Graveyard Disciple” will also light up a stage. The Legendary Acoustic is Back and Better than Ever! Since it’s introduction in 1958, the Epiphone Texan has been the choice of countless musicians including Paul McCartney, Peter Frampton and Noel Gallagher. In fact, McCartney wrote and performed one of the most recorded and popular songs ever, “Yesterday” on his 1964 Texan. Now, Epiphone brings back the Texan combining all the great features of the original with modern updates for today’s musician. Finally – A Smaller Body Explorer with Updated Features! Since it’s introduction in 1958, the Explorer’s angular body shape and aggressive looks has been a of favorite of rockers all over the world. Epiphone puts a new twist on this classic with the NEW Explorer-GT. Featuring a slightly smaller and lighter-weight Mahogany body (about 85%), this new GT is the most comfortable Explorer we’ve ever played. A Real LP Only Smaller! Epiphone’s new LP-Express captures the look, sound and feel of their famous LP’s but in a slightly smaller package that’s perfect for younger players or for travel use. The neck has the same basic dimensions as a full-size guitar but the scale length is only 22.0″ as compared to 24.75″ on a full-size Les Paul. The result is a guitar that’s more comfortable to play – especially for smaller players – while still maintaining good string tension when tuned to standard “E”. A Real SG Only Smaller! Epiphone’s new SG-Express captures the look, sound and feel of their famous SG’s but in a slightly smaller package that’s perfect for younger players or for travel use. The neck has the same basic dimensions as a full-size guitar but the scale length is only 22.0″ as compared to 24.75″ on a full-size SG. The result is a guitar that’s more comfortable to play – especially for smaller players – while still maintaining good string tension when tuned to standard “E”. 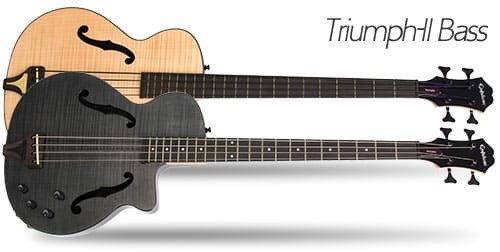 Triumph-II… You Won’t Find Another Bass with These Features! 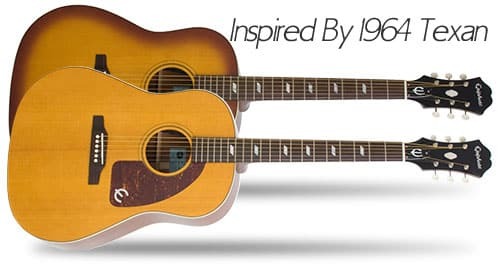 Since 1873, Epiphone has been designing and making some of the most innovative and classic instruments including the Emperor, Broadway, Casino, Wilshire, Coronet and WildKat – just to name a few. The all new Epiphone Triumph-II Bass features classic design styling with an elegant profile that pays tribute to great Jazz guitars of the past. It’s gypsy style cutaway provides easy access to all frets while it’s F-holes and upright style tailpiece pay homage to Epiphone’s acoustic basses of the past.